I’m loving the newest party trend that’s taking over the universe. The tropics are alive and well and I’m in pure bliss soaking up the paradise inspired pieces making the rounds. From clothing, to stationery, to entertaining essentials, the tropic trend is everywhere and I think it’s here to stay (at least for a little bit). Don’t get me wrong, donuts will always hold a very special place with me, and I definitely don’t plan on them going anywhere anytime soon, but I will gladly make room in my party planning heart for the palm print trend! Where can tropical drinks, vibrant florals, steel drum bands, and fresh fruit hangout? At a palm print party, of course! Today, I’m sharing some of my favorite picks to bring a little bit of this trend from the tropics into your next event. So throw on that caftan, slip off your shoes, grab a drink, and let’s dive in! First off, let’s mail something pretty to invite your guests to your next soiree. And what’s better than LETTERPRESS?! Yeah, nothing. These guys definitely win. Follow them up with a cute little palm thank you card and you’re well on your way to being a palm princess. Let’s talk about these palm print pillows. They had me at hot pink stitching. Throw them on the couch, the lounge chairs, or even on the backs of the seats at the table. Either way, these babies need a staring role. The two tones on these palm fringe napkins are so fun and add a little pop but I am OBSESSED with these tiki glasses! Serve up some cool cocktails with mini umbrella’s, and place them on these gorgeous marbled glass coasters. You have a perfect table, but what should you serve? These beef and pineapple skewers with parsley sauce! Yum! Don’t let your guests leave empty handed. Give out some fun swag, like these awesome temporary palm tattoos, and package them up in these cute aloha totes! 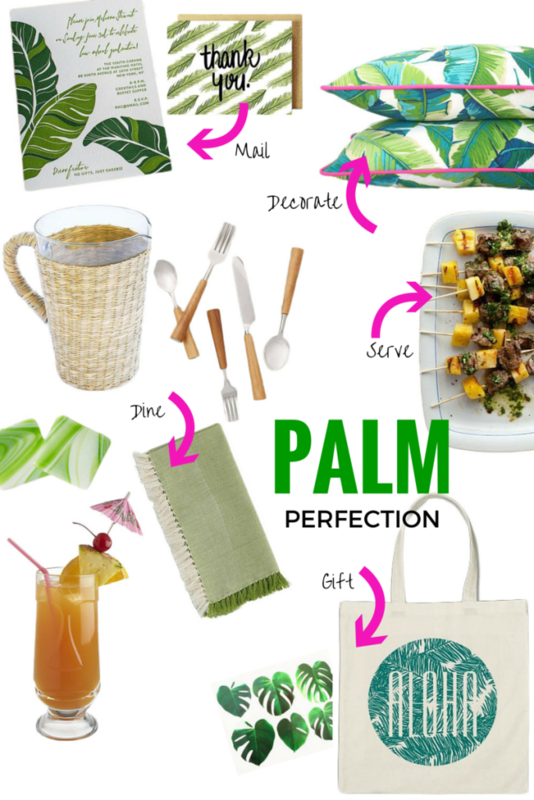 It’s so easy to incorporate a bit of the tropics into your next event, just take a cue from the trends and plan a palm print party that is sure to be palm perfection!